Even before classes began, Jeremy Elan Trilling, an incoming member of WPI’s Class of 2022, stirred up some mystery on campus. As the creator and builder of an electric flying vehicle, his campus forays in his self-described “pumpkin carriage” piqued the interest of students, faculty, and staff alike. Not minding the attention and the questions at all, Jeremy says he enjoys telling people about his invention. “It’s been a bunch of fun sharing this story,” he says. Jeremy and his "pumpkin carriage" have been the talk of campus since their arrival. With the initials of JET, it’s only fitting that he is drawn to things that fly. But Jeremy’s fascination has never been with birds or bugs—his sights are set on much bigger things. He wants to know how to make flight easier for people and is building and investigating electric flying vehicles that could someday become the taxis in the sky. “I have an interest in electric transportation,” he says mildly and with the loose and easy energy of any other 19-year-old. “I’ve pursued that for a number of years … pretty much since elementary school.” But his laid-back vibe gives away not a bit of the depth of that interest, the breadth of his ability to work within that industry, or the intensity that fuels both. Admittedly, he never stops thinking about what’s possible and what he can do next. Jeremy, who plans to major in mechanical engineering, graduated from high school in 2017, and launched into a gap year, traditionally seen as a year off before college for an enriching experience that includes personal growth, reflection, and learning. Despite an education primarily structured by his interests at the innovative Nueva School and a penchant for exploring new pursuits, he initially had no plans to take a year off. He says his gap year took shape when unexpected opportunities arose, and he wanted time to explore them. Fresh out of high school, he moved into a summer internship with Joby Aviation and met with Larry Page, co-founder of Google, over the summer to show him his vehicles (including electric paramotors and an air- and road-worthy conversion of a sailplane) and tell him of his plans. That led to work as an engineer-in-training with Page’s company Kitty Hawk and Cora, an air taxi. 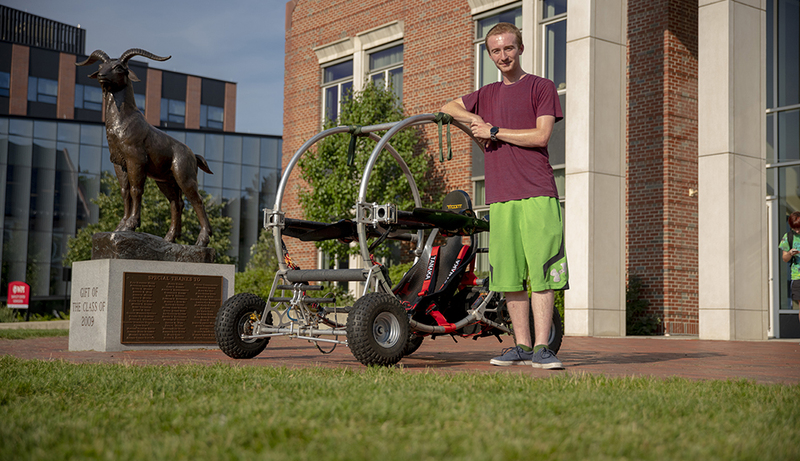 The decision to road test his vehicle, which meets FAA standards for ultralight class, on the way to Worcester was a way to cap off his gap year and launch his college years. And, he says, it was an adventure he couldn’t refuse. WPI’s tradition of theory and practice appealed to him. “WPI seemed like one of the best places where I could direct my learning and where I have the freedom to create and those were the biggest factors for me,” he says. He is already reaping the rewards of WPI’s close environment and even has plans to scope out nearby airfields for more testing with professor of electrical and computer engineering and fellow aviator Fred Looft. The gap year activities have been an extension of the self-starter tendencies that he nurtured at a young age. As a co-founder, leader, and fundraiser for MakeX, a Palo Alto free makerspace, Jeremy established space by and for teenagers who wanted the freedom to create on their own. “Makerspace education and enabling of creativity is definitely what I am all about,” he says. MakeX continues to be a successful city-funded organization, although he has passed the reins to younger teens. For several years, he has been getting around on the JETpack, an electric vehicle he designed and built and started at JETpack Motors. Capable of speeds up to 25 miles per hour and with enough storage space to carry all his books and papers, the JETpack became a common sight in his neighborhood. But for Jeremy, the sky's where it’s at. Paragliding, though “pretty sweet” he says, depends on the weather. Attaching an electric motor means you can fly any time you want. “I’ve been interested in merging my interests—air and road,” he says. The prospect of being able to drive a vehicle to a launch site and then fly with the vehicle attached, means a pilot can land almost anywhere. Accompanied by a traveling crew of friends and family and with research into geography, air currents, and open airspaces, Jeremy attached the “pumpkin carriage” to the back of a van for the cross-country drive. He tested it both on land and in the air on stops along the way, and weather only disrupted plans once, in Colorado. And, in true WPI fashion, when a steering column came apart during a test run, Jeremy fixed it out in the field with a handful of tools and a lot of ingenuity. Although his machine can reach 50 knots (somewhere around 60 MPH) and can travel at heights up to 18,000 feet (or down to just above ground level), Jeremy has his own target in mind. “A couple thousand feet would be a fun place to hang out,” he says.